Well this got really exciting really quickly, didn’t it? If you take what my model generates, since it is based on an average of the top two professional forecasts, as the conventional wisdom, there was a $45M difference between what was expected to happen last week (~ a $66M score) and what actually happened (~ $111M score). That had huge ramifications on the overall standings and it was all thanks to most of us completely underestimating The Money Monster, which crushed even M37’s “calling my shot” prediction that caused him to play it 6x. With 10 players within $20M of the top spot overall, this promises to be the most exciting finish in Fantasy Movie League history this week, so let’s get right to the math behind our choices this week. 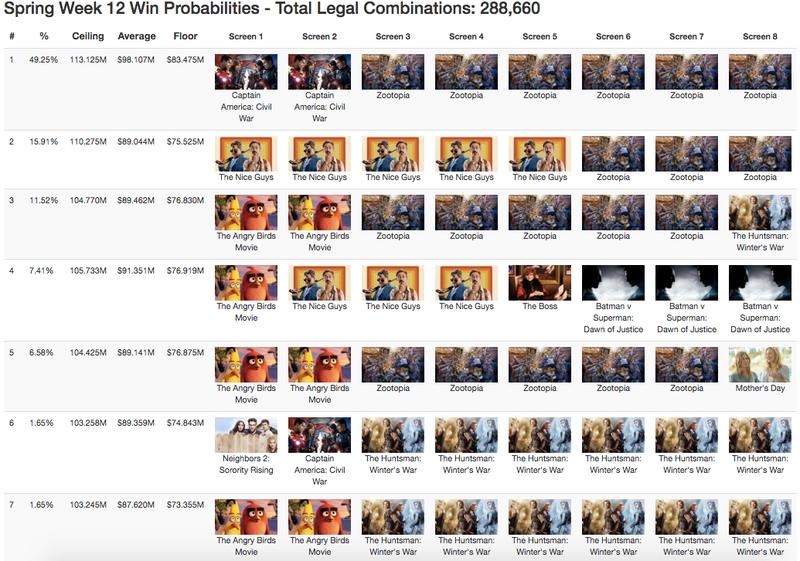 Owing to the idea that “Civil War” will hold and the long tail of “Zootopia” will continue, the combination of 2x the former plus 6x the latter won by far the most simulations in my model this week. This combination has all the things you might be looking for with the highest ceiling and the lowest floor. I predict this set of films will be the most highly played this week and it is what I’ll be playing from my “model only” account. If you have some last minute catching up to do in your league, or overall, this week the pros and the model have some other choices for you. Should you like the upside of “The Nice Guys” (and I don’t) you can go with 5 screens of it and three more of Zootopia. If your “Angry Birds” addiction knows no end, you might consider playing it twice with 5 screens of “Zootopia” and a low end filler and you’d have some high iSpotTV data on your side. But if you’re going to go for it, consider really going for it. The professional forecasts historically have a more difficult time with new films and out of our three choices this week I think the one they are most likely underestimating is “Neighbors 2: Sorority Uprising”. The original did $49M on its opening weekend two years ago, a weekend that also featured a super hero film past its opening weekend. The first “Neighbors” had a 73% Rotten Tomatoes rating when all was said and done and its sequel is at 67% as I’m typing this with slightly more theaters than its predecessor. So why have the pros pegged this film under $40M? If you think it can get to $47.5M (which is still below the original), with all other estimates holding, it gets Best Performer. On my main account, then, I’m riding 2x “Neighbors 2”, 2x “Huntsman”, 2x “The Boss”, and 2x “Batman v Superman”. That’s a pattern we’ve seen before for Perfect Cinema and I’m taking the chance it’ll vault me into the Top 200. Really appreciate all the hard work you put in! Though one aspect that actually really helped me was missing the past 2 weeks; the “Summary Table” of the actual numbers you used when running your Combination Probabilities. I find the Value column to be extremely useful in seeing how closely grouped the movies are or if there are any outliers. I then plug those numbers into my own trending formula to see how off the predictions are and how much wiggle there would need to be to become a Best Performer. Finished 1st in my work league two seasons in a row now (though it got much closer in the last week than I would have liked because I played the same combo you played on your main account of 2x 2x 2x 2x)! Thanks again! I was wondering if anybody would notice I removed that 8). It turns out to be more cumbersome to produce each week than you might think and I know I’m going to be short on time this week, but I’ll consider adding it in the future. Thanks so much for your kind words and your valued feedback!